Background: Parkinson’s Disease (PD) is characterized by alterations in cerebellum and basal ganglia functioning with corresponding motor deficits and neuropsychiatric symptoms. Involvement of oxidative dysfunction has been implicated for the progression of PD, and environmental neurotoxin exposure could influence such behavior and psychiatric pathology. Assessing dietary supplementation strategies with naturally occurring phytochemicals to reduce behavioral anomalies associated with neurotoxin exposure would have major clinical importance. 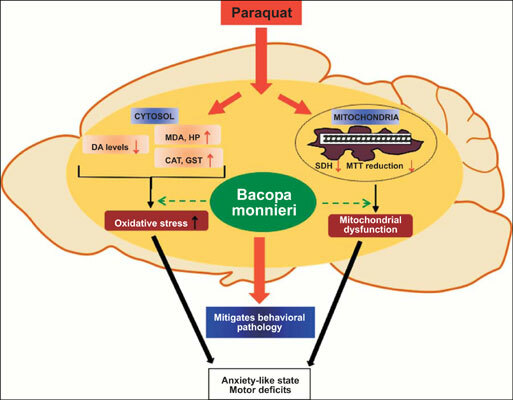 The present investigation assessed the influence of Bacopa monneri (BM) on behaviors considered to reflect anxiety-like state and motor function as well as selected biochemical changes in brain regions of mice chronically exposed to ecologically relevant herbicide, paraquat (PQ). Materials & Methods: Male mice (4-week old, Swiss) were daily provided with oral supplements of standardized BM extract (200 mg/kg body weight/day; 3 weeks) and PQ (10 mg/kg, i.p. three times a week; 3 weeks). Results: We found that BM supplementation significantly reversed the PQ-induced reduction of exploratory behavior, gait abnormalities (stride length and mismatch of paw placement) and motor impairment (rotarod performance). In a separate study, BM administration prevented the reduction in dopamine levels and reversed cholinergic activity in brain regions important for motor (striatum) pathology. Further, in mitochondria, PQ-induced decrease in succinate dehydrogenase (SDH) activity and energy charge (MTT reduction), was restored with BM supplementation. Conclusion: These findings suggest that BM supplementation mitigates paraquat-induced behavioral deficits and brain oxidative stress in mice. However, further investigations would enable us to identify specific molecular mechanism by which BM influences behavioural pathology. Bacopa monnieri, phytochemicals, behavior, oxidative stress, paraquat, Parkinson's disease.